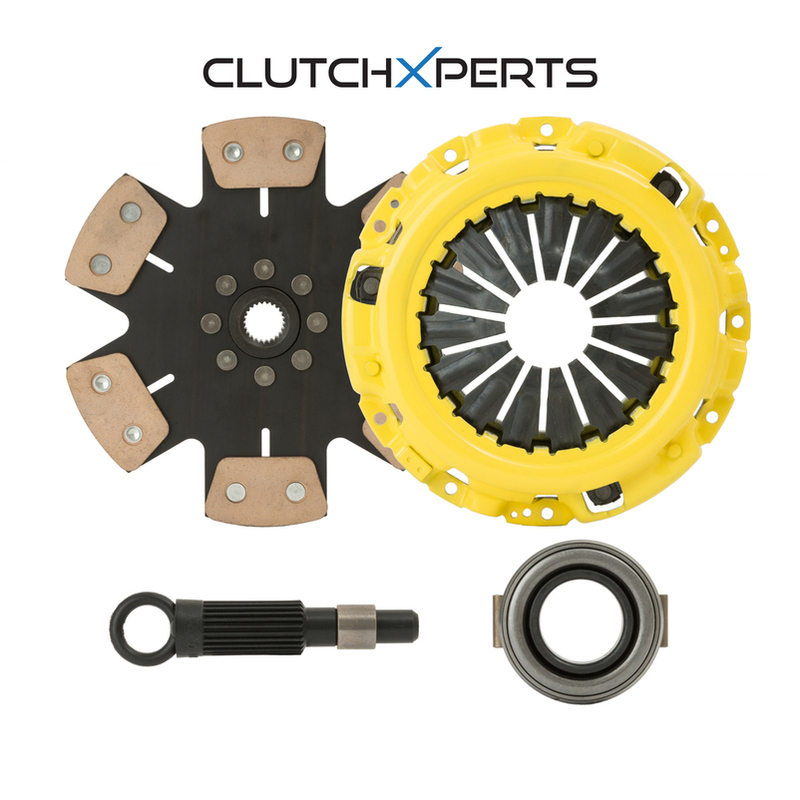 ClutchXperts Stage 5 Miba* Racing Clutch Kit Is a brand new stage 5 Xtreme Duty Racing Pressure Plate With Stage 5 6 Puck Copper Ceramic SOLID Miba Racing Disc Setup can hold and 80% more pressure increase over stock. ClutchXperts Stage 5 Miba* 6 Puck Miba* composite Disc is a best material for friction material in the clutch market uses for. Miba is a material use as Aircraft Brakes which stronger than any other material in the clutch disc indurstry. If you want the best the industry has to offer, ask for ClutchXperts 6 Puck Miba* Solid Rigid Copper Ceramic Miba Racing Disc. The ClutchXperts Racing 6 Puck Miba* Disc also uses our high torque internal assembly, but goes one step further in terms of friction. This disc uses an advanced Miba Delivering Aggressive Bite and increased thermal capacity. Uncharacteristic of the typical aggressive racing disc, The ClutchXperts Racing 6 Puck Miba Strip Disc provides outstanding stability, smooth engagement, and less wear on opposing plates. This combination has proven to be premier unit with regards to both performance and drivability for the daily driver with serious torque holding requirement. This system is recommended as the finest quality 'upgrade' from the original equipment clutch. This kit comes with everything you need for a new clutch job or clutch upgrade. Lastly, resurface and rebalance the flywheel prior to installation for best performance and result. If you see prices way less than others than competitors that means what you get is what you pay for. Made where country with low labor with low craftsmanship with poor materials. • Negligible Mating Material Wear. • Miba Generates 3 To 15% Lower Torque Peaks Compared To The Competition; Reduces Gear Shocks Loads And Same Material As Using Aircraft Brakes. Miba Friction Group Has Been A Development Partner And Supplier Of High-Performance Friction Materials To The Automotive And Machine Industry For Over 30 Years. We Offer Optimized Components For Clutches, And Use High-Quality Materials And Innovative, Technologically Advanced, Processes To Ensure Excellent Wear-Resistance And Friction Coefficients.Clutch Segments Generate The Friction Needed For Torque Transfer From Engine To Transmission, Enabling The Vehicle To Start. They Are Characterized By Particularly High Temperature Resistance And Low Wear.Friction Materials Are An Important Performance Element In Vehicle And Machine Clutches, And Play A Key Role In Overall Efficiency.